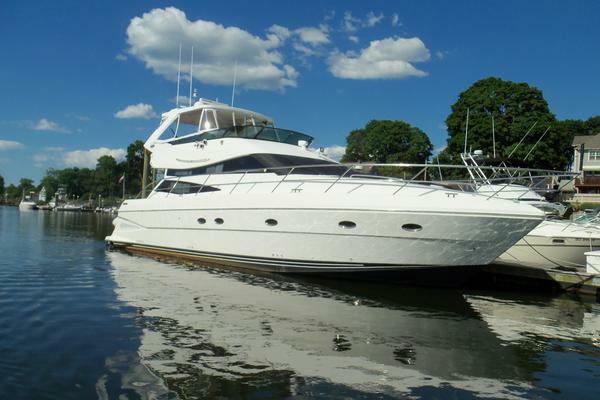 She represents the best-priced low hour 530 Ferretti. Make an offer owner wants to move up. OVERVIEW: Sleeps 6 in 3 staterooms. 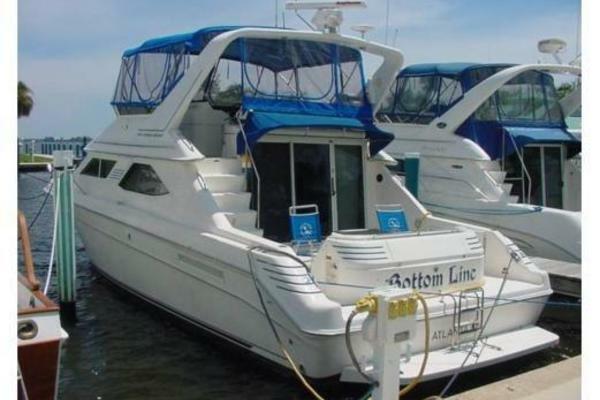 There are 3 owner and guest staterooms including 3 guest heads. VESSEL WALKTHROUGH: The exciting 53 Ferretti offers the elegent features of a much larger yacht. From the richly finished high gloss wood interior to the granite galley countertops, this Ferretti epitomises quality. Two separate companionways are available to the flybridge; one from the salon area and one from the aft deck and the jet-boat tender rests comfortably on the oversized swim platform. MASTER STATEROOM: The Master Stateroom features Mirrored headboard and queen berth w/ linens and bedspread, (4) Stainless portholes w/ covers, 20in Flatscreen TV, Fully fitted, removable carpeting, 110 V AC electrical system, Curtain, Stereo system w/ speakers, Headliner, Ventilator under the mattress, Overhead hatch w/ sliding door, Storage box under the bed, Reading light, and (2) Lockers w/ built-in safe deposit box. GUEST STATEROOM, Below Deck Amidship Starboard: The Guest Stateroom features a Twin berth, (2) Stainless steel portholes w/ covers, (2) Twin berths w/ linens and ventilation under mattress, Fully fitted removable carpeting, Flatscreen TV Mirror, Bedside table w/ reading light, (3) Drawers, and Side overhead lockers. GUEST STATEROOM, Below Deck Amidship Port: This Guest Stateroom features Twin berth w/ linens and ventilation under bed, (3) Drapes, Flatscreen TV, Curtain, Bedside table w/ reading light, Mirror, and Side overhead lockers. MAIN SALON: The Main Salon features an Entertainment center, Venetian blinds at salon door and aft window, Flatscreen TV w/ surround sound system Fully fitted removable carpeting, Refrigerator bar w/ drawer, (2) Arm chairs, U-shaped leather sofa w/ table, Sliding glass door w/ stainless frame, Stairs to main bridge, Curtain, Opening salon window, and a Headliner. DINETTE AREA: Highlights: U-shaped raised dinette to starboard w/ table. GUEST HEAD: The Guest Head features a Shower w/ plexiglass enclosure, Stainless steel porthole, Sink, Mirror, Holding tank indicator, Marble countertop, and Overhead lockers and shelves. MASTER HEAD: The Master Head features an Electric, freshwater water closet, Overhead locker and shelves, Shower w/ plexiglass, and countertop. CREW QUARTERS: This area features a Single berth w/ linens, Locker, Manual WC, Porthole, Handheld shower, Mirror, and a Folding sink. GALLEY: The Galley features a Refrigerator w/ freezer, Fire extinguisher, 4 burner, electric stove, Granite countertop, Convention/ microwave oven, Cutlery drawer, (2) Lockers, Garbage disposal, (2) Sinks, Porcelain table service for six (6), exhaust fan for cooktop, and US 60-cycle appliance. PILOTHOUSE: The Pilothouse features a Flybridge ladder, Barometer colck and hygrothermometer, Autopilot, Barometer, VHF radio, Compass, DGPS chart plotter / ecosounder w/ radar inteface, Depth sounder speed log and water temp control, Micro commanders and bow thruster control, Satelite phone, Engine controls w/ full instrumentation, Fuel gauge, Cigarette lighter, (12V) outlet, Removable fitted carpeting, Helmseat, Remote control for spot light, Window covers for front and side windows at helm area, Rudder position indicator, Windshield washer and wiper, Windshield, and a SAT T.V. FLYBRIDGE: The Flybridge features a Liferaft, Fiberglass radar arch, Life jacket, Fiberglass radar mast, Life ring, TV antenna, Bimini top, Depth sounder speed log and water temperature indicator, Autopilot, Smoke alarm in engine room, VHF radio, Copilot bench seat (seats 3), DGPS chart plotter repeater, Helmseat and passenger's bench seats with covers (2 seats), Micro commanders and bow thruster controls, Sunbathing cushion, Spare shaft, Spot light w/ remote control, Hydraulic wheel steering, Electric operated instrument panel, Waterproof 110V outlet, Rudder position indicator, Round sofa (seats 6) with table, Cabinet w/ sink, fridge, electric cook top and lockers, Stereo system with watertight cover and speakers, Plexiglass and stainless front windshield (windscreen) w/ side wings, Bruce anchor w/ 75' chain, Coast Guard safety package, Horn w/ compressor, Mooring line chock, Side and bow rail w/ gates, Mooring cleat, Electric windlass w/ controls in foredeck, bridge and flybridge, (6) fender, Sunbathing cushion on foredeck, External audible high water alarm, Boat hook, Fire extinguisher, Non-skid decks, stainless deck hardware, water, telephone and TV dockside hookup. AFT DECK: The Aft Deck features a Shower w/ hot and cold water at transon, Electro-hydraulic stainless and teak, extendable gangway (passerella) w/ remote control to lift tender, Ladder to water from swim platform, Cockpit seat cushion, Ladder to flybridge, Icemaker, Swim platform w/ electric opening hatch and storage for PWC, Cockpit lights, Teak cockpit, and stern pole. ENGINE ROOM: The Engine Room features Twin x 660/hp Diesels IB; Hrs: 700 2001 Caterpillar 3196 DITA, Remote control BC5000 fuel shut-off valve, Marine air water chilled air conditioner, Water heater 220V, Automatic/ manual and centralized fire control system, Electric bilge pump system w/ 1 manual pump, Spare set of propeller, Fuel tank indicator, (2) Raw water sea strainers, Fuel tank in fiberglass w/ settling, Dripless shaft seals, Trouble lamp, Holding tank w/ gauge including deck pump out, Coast Guard safety package, Trim tabs, Access hatch from the cockpit, Fresh-water outlet for refilling and washing, Underwater exhaust system, (3) Stereo systems, Fire extinguisher, Spoiler sump pump w/ 1 automatic electric pump, Electrical bilge blower, Waterlight bulkhead forward and aft, Fuel filter, and Air intakes w/ remote controlled closing; change over valve to allow engines to pump water from the bilge. ELECTRICAL SYSTEM: The Electrical System features a 24V DC electrical system, Battery charger, Battery bank, Battery parallel switch, 12V generator batteries, 24V engine starting battery, 15kW generator, and a 220V dockside electrical cable.